Tramping up the hill with Bayboh on my back and a huge bag of school supplies in each hand, chirping "Come on! We want to be on time!" with an undertone of desperation, I was both ridiculously pleased with myself that I thought to do a dry run the day before (we bested our time by 5 minutes today, meaning we were ever so slightly early!) 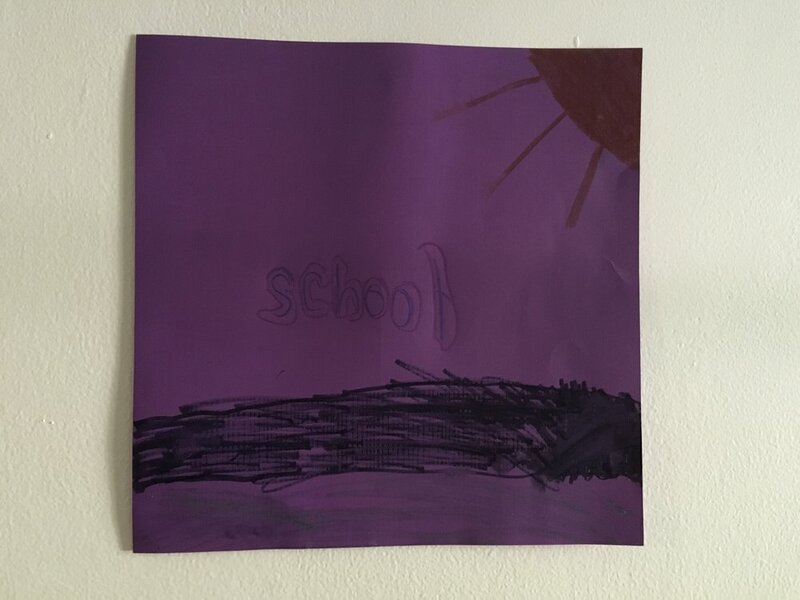 and seriously annoyed with the universe that all that planning and effort and good idea-ness hadn't magically gifted me a morning where we arrived with 20 minutes to calmly meander to the classrooms, take a photo, wave at some other parents, that kind of thing. I didn't take a photo until they were in their pajamas this evening. But we were close enough to on time, personal hygiene needs had been taken care of, and everyone was dressed in clothes that looked passably the right size and not like they'd been through a mauling by a large cat, which you'd think would be a low bar, but there had been some question as to whether we would clear it merely a quarter hour earlier. So. 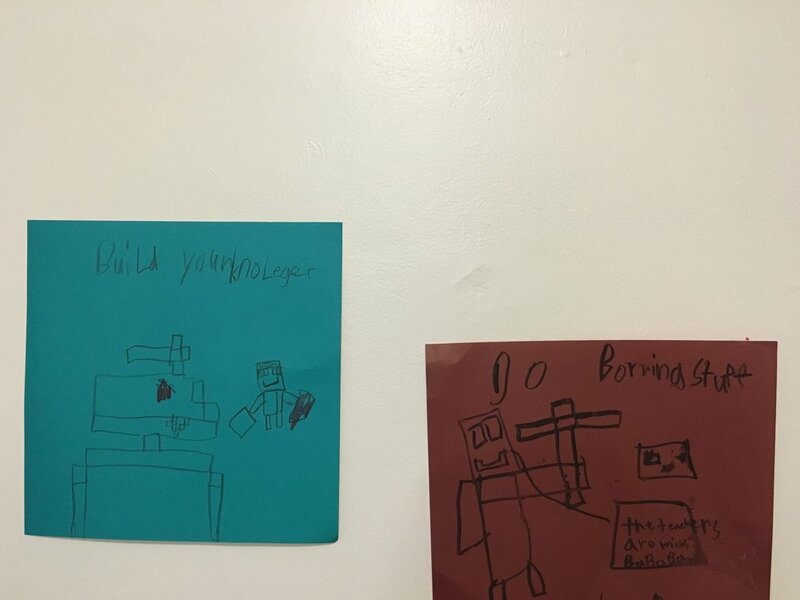 They made some inspirational back to school posters yesterday. "Build your Knowledge," proclaims Mr. P, "Do Boring Stuff." "Fight The Bully," we'll take the swords dripping with blood in the metaphorical sense. At least, when he did get home and told me about his day, it was mostly postive and the only bully story was about someone putting boogers on a carrot and throwing it in his lunch box. Kids are so gross. But he didn't seem to upset and says he just removed the carrot from his box and it wasn't a big deal. I thought it was kind of a big deal that I boiled three separate eggs for Shmoogie's lunch this evening (7 pm was the one I made and put it in the fridge, 7:30 pm was the one I made while Bayboh was eating that one, 8 pm was the one I made after the second one fell on the floor because I tried to put it in the fridge balanced on top of the sandwich container with only one hand because the other hand was holding Bayboh, who had recently fallen on his face while playing gleefully with his older siblings.) But, really, booger-smeared carrots might be worse. And smacking your face on the floor is definitely worse. And, really, the second one was probably rubbish anyway because I forgot to set the timer.